I was glad to see that among ASCD’s most clicked on articles of the month was one entitled “Schools slowly add phones, PDAs to curriculum.” Glad the article was published, on MSNBC, and glad that so many educators are clicking on it. I don’t need to repeat myself at too great a length– it is a drum I am beating– but powerful digital tools belong in the hands of students as they do the work of learning in the 21st c.
And then the backlash arrives, parents and others complaining that phones will be too distracting when used in school. Of course they will be, if we are not engaging and motivating our students, and holding them accountable for their quality results. But if we do do these things, then we can empower and prepare our students with contemporary tools. Even Mayor Bloomberg is cited here, reportedly opposing phones in schools “You come to school to learn, not to play games or send text messages.” Mayor, please. Students will learn more if they can use smart tools, if they learn how to use phones and text messages to acquire and process information. And if they learn by playing games, that is not such a bad thing anymore. They point is that they learn. Hard not to notice and be annoyed by the product placement ads accompanying this article on MSNBC, though. 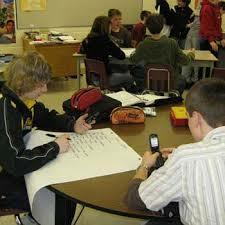 A big colorful web-page devoted to the virtues of cell phones in schools, with advertised circling advertising…. cell phones! I too am an advocate of using technology in an engaging manner in the classroom. When technology is used the right way the distractions of popular websites (facebook, etc.) will lose their appeal during class time. That being said, here is a personal pet peeve – why does St. Gregory insist on its students using dated calculator technology in their advanced math classes; nothing more advanced than a TI-84 is allowed even though College Board allows much more powerful calculators on their exams?